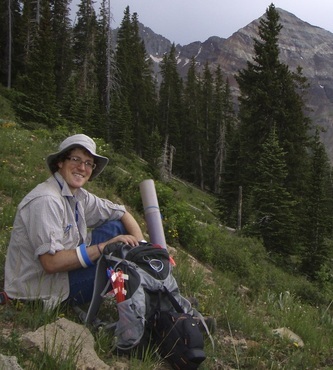 I study how human-caused climate change impacts natural systems. Humans have drastically reshaped the face of the planet (see this image of the earth at night, or this map of the world's net primary productivity appropriated by humans), and we are in the process of reshaping the climate system. How will the world's plants and animals respond as global temperatures continue to rise and global precipitation patterns shift and become more extreme? How will rising atmospheric CO2, land use change and wildfires mediate ecological responses to climate change? I am interested in how tissue- and plant-level physiology scales up to population dynamics, ecosystem dynamics, and global water and carbon fluxes. I explore how leaf-level plant phenomena scale up using a combination of leaf level, plot level, and satellite data. Geographic range shifts are one of the most commonly observed and predicted responses to a changing climate, and much of my work seeks to understand how climate controls plant range boundaries so that we can predict and prepare future range shifts (or help species that can't move but need to). I combine methods from community ecology, dendrochronology, and plant ecophysiology to understand the range dynamics of tree species across the western U.S.A. and Australia. I received my PhD in Biology from the University of Washington in June 2017 (working with Dr. Janneke Hille Ris Lambers), and am currently a NSF Biological Collections and NOAA Climate and Global Change Postdoctoral Fellow with Dr. Todd Dawson (UC Berkeley) and Dr. Joe Berry (Carnegie Institution for Science, Dept. of Global Ecology). 1. Exploring intraspecific trait variation in stress tolerance traits. I use within-species trait variation to determine the physiological mechanisms by which climate controls range limits. I also seek to quantify the dominant scales at which key plant functional traits vary (within an individual, between individuals within a population, between populations as a function of climate, or between species). Functional traits are a critical tool in sub-disciplines ranging from community ecology to ecophysiology to vegetation modeling, yet we know surprisingly little about trait variation within individual species. I use the variation of stress tolerance traits across species ranges to understand the physiological drivers that constraint the distributions of species with differing physiologies. 2. Determining where tree ranges are limited by climate vs. biotic interactions. This distinction is critical for understanding where we can apply different prediction tools (e.g. climate envelope models may work well for projecting the movement of climatically constrained but not biotically constrained range boundaries). I use a variety of methods, particularly dendrochronology, to differentiate the drivers of tree range boundaries in a variety of climates to understand where different range constraints are most prevalent. 3. Predicting plant and ecosystem responses to rising CO2. Plants are merchants who sell water to the atmosphere in exchange for CO2 to make sugars. Human CO2 emissions have shifted the global water-carbon market place in plants favor, yet the observed 'CO2 fertilization' effect of this shift has proven extremely variable and hard to detect in nature. Using historical plant specimens stored in herbaria, modern comparison samples collected from the same locations, and mechanistic plant physiological models, I attempt to reconstruct how plants have altered their physiology, morphology and growth in response to a century of rising CO2. The global plant CO2 fertilization response is one of the largest uncertainties in the future of the global terrestrial carbon sink, and goal of this work is to constrain these uncertainties by understanding how environmental context (e.g. amount of water stress) and plant traits (e.g. water use strategies) determine plant responses to CO2. 4. Understanding climate-induced forest mortality and the ecological impacts of extreme drought. I study the ecohydrology and ecophysiology behind climate-induced tree die-off, as well as the consequences of canopy tree mortality for plant communities. Much of this work has focused on Sudden Aspen Decline (SAD), a regional scale forest die-off that affected trembling aspen (Populus tremuloides) across the Rockies following the 2002 drought. Recently, a similar die-offs have been sparked by droughts in 2012 and 2018, providing us with a useful (if depressing) opportunity to test the predictions we made following our work on the 2002 drought. I have also recently begun investigating California oak mortality following the 2014/15 megadrought.